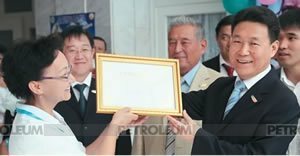 In early September the celebrations were held in E^yzylorda devoted to the 25th anniversary of the start of commercial development of the Kumkol oil field. 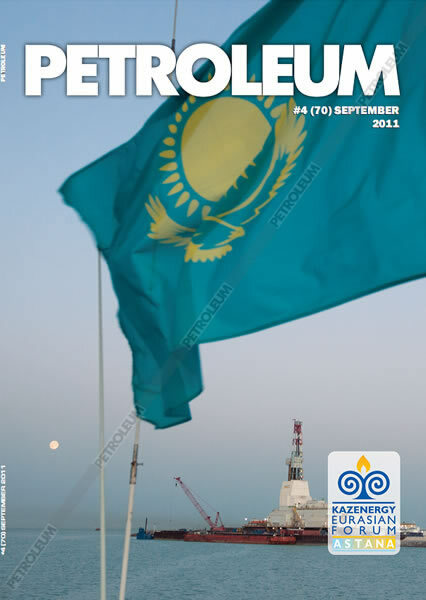 For the oilmen of Kazakhstan this year is really rich with anniversaries. It was one hundred years of the Dossor field, fifty years of the Mangyshlak oil and now, a quarter of a century since the start of commercial development of the Kumkol field which has become a driving force for the industrialisation of Kyzylorda oblast. For two and half decade the Kyzylorda region has turned out from the agricultural region to one of the country’s largest oil and gas centres. Turgai lowland, it is named also as depression, is a flat plain stretching out between the South Ural Mountains and I`ugodzhar from the west and the Kazakh geological fold from the east. Here, under lifeless steppe and semidesertic spaces, in Soviet times the geologists discovered the richest reserves of minerals: iron ore, coal, bauxites, asbestos, chrome, manganese, nickel and valuable building materials. And finally, oil and gas. 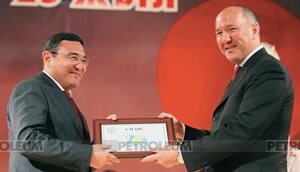 Since then the region has received the new name of «Big O`urgai». In 1982, PGO Yuzhkazgeologia, Kazgeophyzika and the Institute of Geology and Oil of the Academy of Sciences of the Kazakh SSR worked out an exploration program for the South Turgai depression. 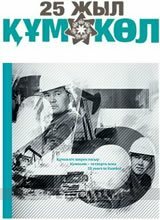 In 1983 the South Kazakhstan oil exploration expedition drilled the first deep well on Kumkol. In the winter of 1984, the team of J. Kamalutdinov received the first fountain of oil on Kumkol. After the discovery of the Kumkol field, in 1984, the fields E^yzylkiya, I`a`ibulak, A`ryskym, Akshabulak, Nuraly, A`ksai and others were opened. The resource potential of the Kumkol group of fields was assessed at 160 million tons of oil and 19 billion cubic meters of gas. Since 1986, the commercial development of Kumkol has started. The accumulated volume of oil produced from the field for this time exceeded 28 million tons. With the arrival to the field of PetroKazakhstan Kumkol Resources (PKKR) the region has received a powerful impulse to development. Today the company is not only the major donor of the regional budget, but actively participates in the region’s social and economic development and environmental programs. Annually, the memorandums on mutual cooperation in social and economic development of the Kyzylorda oblast and improvement of the well-being of the region’s residents are signed between the Kyzylorda oblast Akimat and JSC PKKR. Only in the last year the company has allocated more than $4 million on these purposes. In the first half of this year the volume of investments into the social sphere already totaled up to $2.2 million. In the day of the anniversary of its the largest asset – the Kumkol field – the company has made one more remarkable gift to the Kyzylorda residents: a sponsor’s assistance to the regional children’s hospital worth $150 thousand. Due to PetroKazakhstan, the regional children hospital has acquired the oxygen concentrator OXY 6000 (Germany); the open resuscitator PANDA (USA); the mobile analyzer of gases of blood and electrolytes OPTICCA TS (USA); the device for membrane medical plasmofores Hemophoenix (Russia); a dental unit CHIRFDENT (Slovenia) and other advanced medical equipment of the USA, Russia, Belarus, Germany and the UK origin. At the ceremony of medical equipment handing, the President of PetroKazakhstan Wei Yuxiang wished to all small patients a speedy recovery. - On behalf of all patients and doctors of our hospital I thank PetroKazakhstan for such a great gift! These are advanced devices and equipment which we need so much and which will help our doctors to diagnose, recover the health of sick children and reduce their rehabilitation period. PetroKazakhstan has also become a sponsor of the republican exhibition of the Kazakhstan artists which was opened in the lobby of the new scientific and technical library in Kyzylorda. Over 120 artworks by thirty well-known artists from E^yzylorda and Almaty were displayed at it.